Traditional welcome at Delhi airport on arrival. Transfer to hotel for rest. Delhi sight seeing on choice (optional) or visit to city of tajmahal (optional)- sikandra & agra fort/ or drive from delhi to hardwar- rishikesh. Night stay at rishikesh. Haridwar : Hardwar or haridwar are two names for the same piece. The whole of uttrakhand is dotted with temples of vishnu & shiva. Vishnu is known as hari and shiva as har dwar means gate, and it is for this reason that this place is known as haridwar or hardwar, as it is the gateway to shri badrinath and shri kedarnath, the holy shrines of hari and har. The hindu pantheon allows freedom of worship of gods in any form. Uttarakhand abounds in shrines of gods & goddesses and haridwar from time immemorial has been the gateway to these shrines. Rishikesh : Rishikesh is situated on the trisection of three districts of garhwal division and most of the city lies on the right bank of the River Ganga, the place of sages is a celebrated spiritual town on the bank of ganga and is surrounded by shivalik range of the himalayas on three sides, it is said that when raibhya rishi did hard penances, god appeared by the name of hrishikesh and this area henceforth came to be known as rishikesh. Rishikesh dventurous visitors, rishikesh is the place for starting their trekking expeditions and excursions towards the himalayan peaks, 10 km upsteam at shivpuri is the site for river running, rafting activities, on the roaring white water of ganga, from October to May. The international yoga week, which attracts participation from all across the world, is held here every year from 2nd to 7th Feb. on the bank of ganga river. Leave rishikesh early morning for joshimath via devprayag, ruderprayag, karanprayag and nandprayag see those places famous for confluence of two great river and proceed to joshimath via chamoli and pipalkoti. Arrived joshimath late afternoon visit adi guru shankracharya seat narshimha temple or a visit to auli (famous winter hill resort for skiing) by lift chair car. Night stay at joshimath, skiing courses in winter can be organised on request at auli. Leave joshimath early in the morning for badrinath ji reach badrinath at 11 am. Badrinath : Badrinath is one of the four dhams of the country and situated at an elevation of 3133 mts. Above sea level, guarded on either side by the two mountain ranges known as NAR & NARAYAN , with the towering NEEL KANTH PEAK providing a splended back-drop. This revered spot was once carpeted with wild barries which gage it the name "badri Van" meaning forest of berries. Facing the temple at the back of alaknanda river there is a hot water spring known as TAPT KUND. 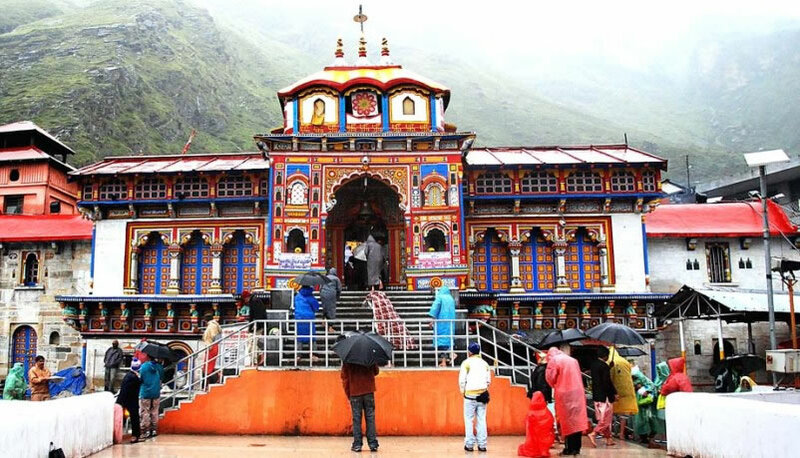 Badrinath Temple : Dedicated to lord vshnu, the temple of shri badrinathji is 15 mts. In height built in the form of a cone with a small cupola of a filt bull and spire. Legend dates the temple prior to the vedic age. EXTENSION TO VALLEY OF FLOWER AND HEMKUND SAHIB ON DEMAND. Temples : Rudranath And Chamunda Devi, arrived in the evening, overnight stay at Rudraprayag. Leave Rudraprayag for Sonprayag via Guptkashi. Arrival early afternoon at sonprayag. Sonprayag : Situated at the confluence of Soneganga and Mandakini river. The road to Trijuginarayan diverts from here. Trijuginarayan : According to legend, this was the place where the weeding of Lord Shiva and parvati was solemnised. In front of the Shiva temple, is an eternal flame, which is said to be a witness to the marriage. Can be reach by 12 km drive from sonprayag. Evening free to enjoy the surroundings. Overnight to stay at sonprayag. Early morning dep. To gaurikund (14 km trekking) after having morning bath at hot spring "KUND" Garurukund leave for trek to Kedarnathji temple by dolly-ponny (14 km) reach Kedarnathji in afternoon. Kedarnath Temples : An imposing sight standing in the middle of a wide plateau surrounded by snow covered peaks. The present temple built in 18th century A.D. by Adi shankaracharya, stands adjacent tot he site of earlier temple built by the pandavas. The inner walls of the assembly hall are decorated with fitures of various deitties and scenes from mythology. Outside the temple door a large statue of the nandi bull stands as guard. Dedicated to lord shiva, the exquisitely architectured, kedarnath temple is considered to be more than 1000 years old. Built of extremely large heavy and evenly cut grey slavs of stones. It evokes wonder as to how these heavy slavs had been handled in the earlier days. The temple has a "Garbha Griha" for worship and mandap appt. for assemblies of pilgrims and visitors. A concial rock formation inside the temple is worshipped as lord shiva in his sadashiva form. Rest at bunglow visit to kedarnath ji temple for aarti, darshan. Overnight stay at kedarnath. Trek down from kedarnath ji to gaurikund to get your parked bus or car and drive to syalsore only 70 km to complete. Rest at river side resort. Overnight stay at siyalsore. Leave siyalsore to uttarkashi (18-0 km) via ghansil-baldianaa. Arrival uttarkashi late afternoon visit to famous nehru mountaineering inst. (arrording to the timing) overnight stay at uttarkashi. Leave uttarkashi to gangotri via lanka-bjaironghati. Arrived gangotri afternoon gangotri. The shrine of gangotri situated at an elevation of 3200 mts. Above sea level. The temple, constructed by the gorkha general amar singh thapa in the 18th century is situated on the back of bhagirathi. Evening free for darshan-pooja at ganga ji. Gangotri Temple : As legend goes raja bhagirath used to worship lord shiva at the sacred stone near which the temple is located. It is believed that goddess, ganga first descended to earth from heaven at this stone. Amar singh thapa, the gokha commander of garhwal, in the 18th century A.D. constructed this temple. It is also believed that the pandavas come here to perform the great deva yagna to atone the death of their kinsmen in the bettle of MAHABHARATA. Overnight stay at gangotri. Leave gangotri to hanumanchatti (210 km) via- barkot, arrival hanumanchatti late afternoon. Rest night stay at hanumanchatti. (CAN BE EXTENDED ON DEMAND TO GAUMUKH GLACIER, NANDANVAN OR TAPOVAN) every september special gangotri-gaumukh mediation tour, organised on demand to explore divine life, to meet indian saint. Leave gangotri to syana-chatti, night rest. Yamunotri : situated at a elevation of 3235 meters above sea-level, the shrines of yamunotri is one of the tour dhams of uttakhand. The source of yamuna lies about 11 km ahead at an attitude of about 4421 meters. The approach is extremely difficult and pilgrims therefore offer pooja at the temple itself. Hanumanchatti or 5 km from jankichatti. Darshan pooja trek back or come down to jankichatti 6 km below the temple. Overnight stay at sgnachatti. Transfer and sightseeing by non-a/c car.